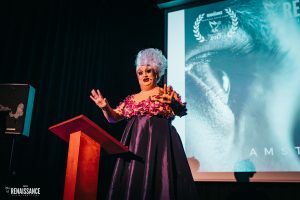 NRFF Amsterdam closed a wonderful weekend of independent film entertainment, masterclasses and filmmaker Q&A’s at LAB’s arthouse cinema, with a celebration presented by the talented and glamorous Lady Galore, who brought fun and laughter to the evening’s celebrations. Congratulations to all the festival winners and nominees. A big thank you to all of the filmmakers who traveled from the four corners of the world to attend and support their films and the festival in our inaugural year; to Ernie Tee and Marta Parlatore for their excellent masterclasses; to the LAB team for all the help they provided during the festival; to our partners Short Shorts, InkTip, GetFilming, Film Inquiry, Human Hotel and Patroc; and finally to iAmsterdam and Het Parool for the publicity. We truly look forward to next year.